500ml bottle of Ilford Ilfosol 3 film developer concentrate. Ilford Ilfosol 3 is a one-shot, general-purpose, liquid black and white film developer, particularly suited for use with medium and slow speed films such as PAN F PLUS, FP4 PLUS and DELTA 100 PROFESSIONAL. It ensures fine grain and optimal sharpness at full film speed, and is typically diluted at a ratio of 1:9 for one-shot use. 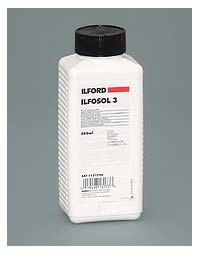 For detailed information on Ilford Ilfosol 3, please refer to the Technical Information PDF.